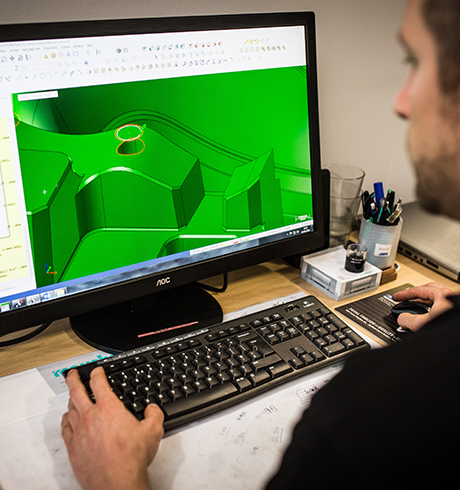 Through thorough analysis and specific material selection, we can strengthen the confidence of your project and offer a rapid prototyping service to compliment the design – this provides ample opportunities for functionality testing which will highlight any possible alterations that need to be made to the design to best suit your market requirements. • SLA or stereo lithography prototyping – the construction of a component from 3D data using a tank of resin and a laser to create the model. The prototype is removed from the tank and stabilised under a UV lamp. Lead times could be as low as 2-3 days, depending upon complexity. • SLS or selective laser sintering – this involves the construction of a component from 3D data suing resin powder and a laser. Simulant injection moulding grades can be used to provide some of the properties, including ‘live hinge’ components. Lead times could be 2-3 days, depending on complexity. • Vacuum casting rapid prototyping – design engineers use a model created initially from the SLA process, which is hand-finished to generate a “master” part to cast a silicon tool around. This prototype will then be used in the vacuum casting process to ‘mould’ up to 25 parts from the tool. Materials can be offered in a number of simulant materials, in order to achieve some of the properties of injection moulded components. Lead times could be 7-10 days, depending on complexity. With full assistance through your product’s development cycle, we can ensure that your product will reach the marketplace in a fully functional and cost-effective manner. Each rapid prototyping process can offer a variety of post-mould finishes and painting techniques, in order to create a professional look. At this stage, our engineers can recommend further rapid prototyping tooling options to achieve a more aesthetically pleasing and functional product. To learn more about our rapid prototyping and design for manufacture service, please give us a call on +44 (0)1670 541890, alternatively you can use our online enquiry form. We also offer production tooling, plastic injection moulding and post mould operations to further support your manufacturing processes.